Robert Melino is the managing partner and clinical director at Bay State Physical Therapy in Tewksbury and Lowell. Prior to opening the Tewksbury clinic in 2015, Robert served as the clinical manager for 9 years at Bay State Physical Therapy in Arlington. Rob believes that sound manual therapy is a must when treating patients. 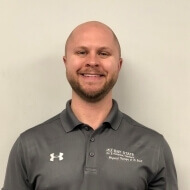 After graduating from Northeastern University in 2006 with a masters degree in physical therapy, Rob attended the Institute of Orthopedic Manual Therapy. For two years, Rob refined his manual therapy skills under the direction of Martin Langaas, a top PT in the field and mentor to many that have gone through the program. Rob graduated from the Institute with full fellowship status and is a credentialed orthopedic manual physical therapist. Rob’s passion lies with treatment of the cervical/thoracic spine. He also enjoys working with rotator cuff pathologies and post-op ACL reconstruction. Rob utilizes his manual techniques along with specific therapeutic exercise to help his patients achieve their desired goals. He has a function oriented approach and believes it is important to involve the patient when formulating the plan of care. Rob integrates strong patient education into his rehabilitation in order for the patient to understand their diagnosis and the necessary steps that need to be taken to get better. Rob is a resident of Tewksbury where he lives with his wife and two daughters. He enjoys an active lifestyle and is an avid Boston sports fan. Rob participates in local community based events and is excited to help and serve the residents of the Merrimack Valley area.